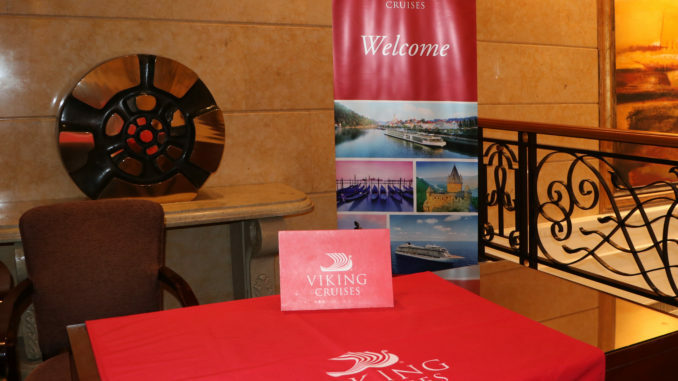 We heard great things about the Viking Cruises excursion to China. It was on our travel wish list for a long time. When we finally checked it out, we were amazed to find it was a very different Viking Cruises itinerary. 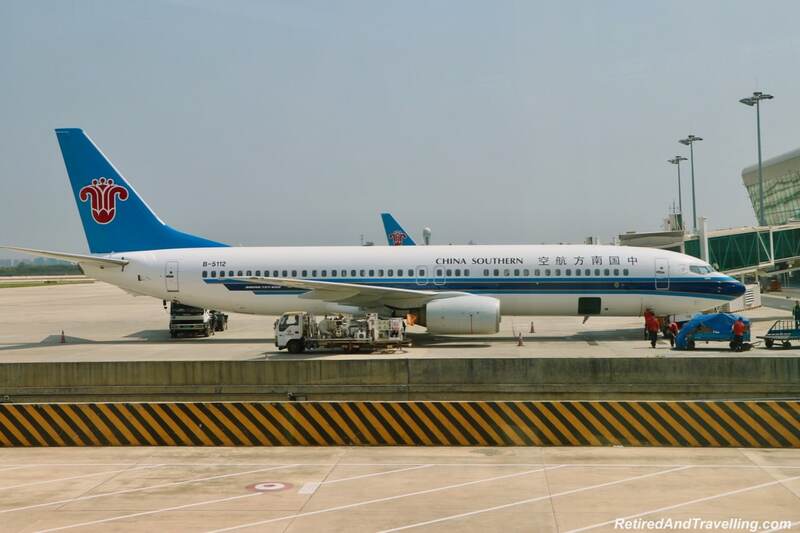 The main part of the “Undiscovered China” trip went from Shanghai to Beijing. And then we added on a post-trip excursion to finish in Hong Kong. 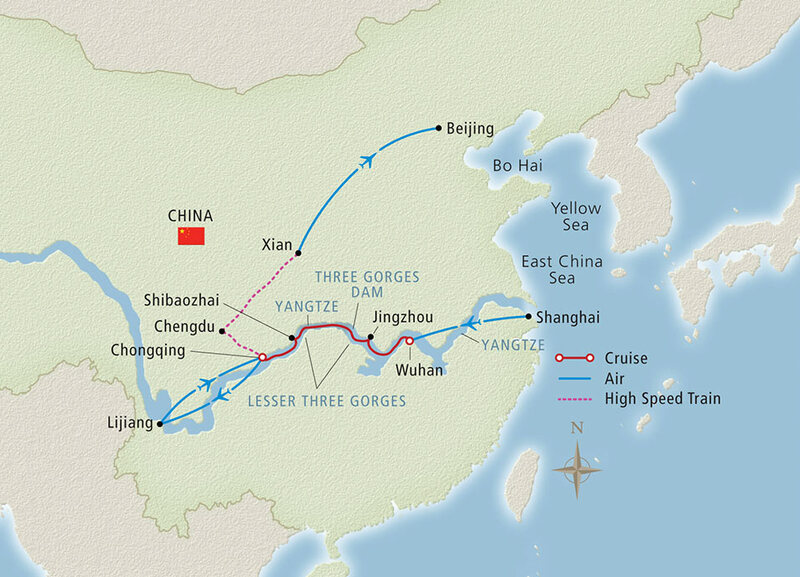 Of the 23 days of our trip, only 6 days were actually river cruising on the Yangtze River. 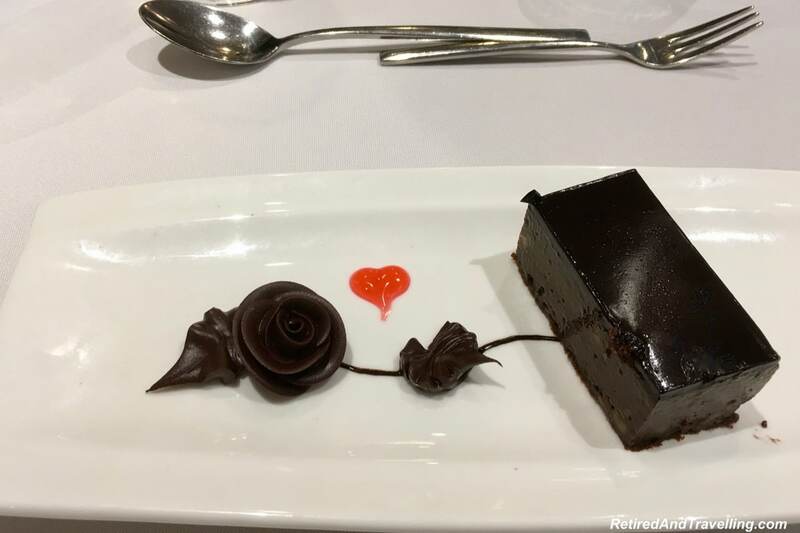 Our first Viking Cruises experience was not a typical one. But it gave us a much broader view of what Viking Cruises has to offer. 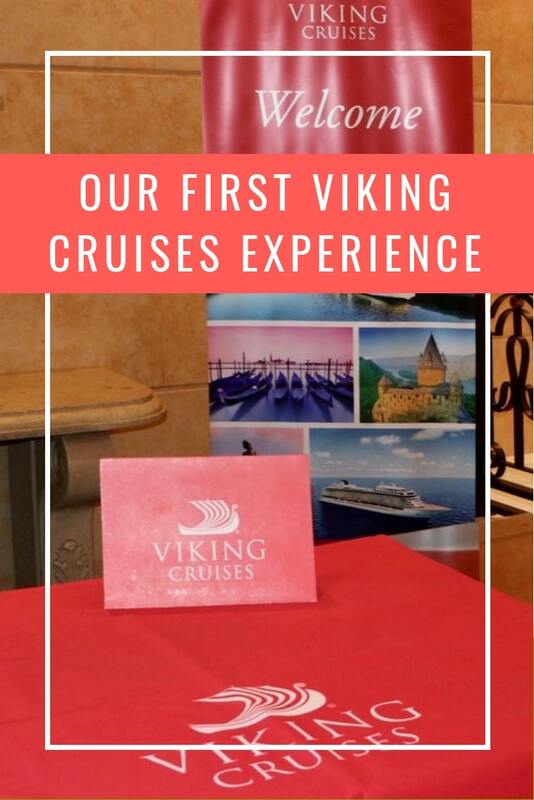 It quickly became evident as we talked to people that our first Viking Cruises experience in China would be different from what many people had on other trips in Europe. The biggest difference was how few days we actually spent river cruising. 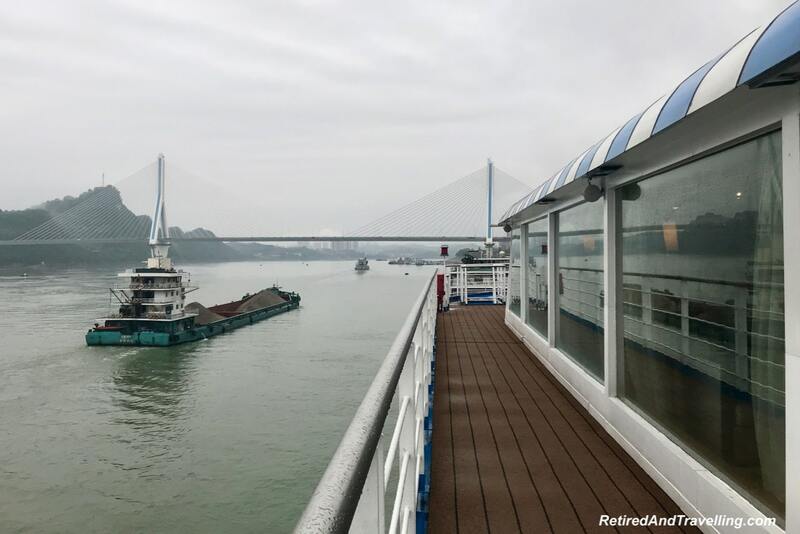 The 6 days cruising the Yangtze River were a small part of our overall 23 day trip. The other days were spent doing extensive day trips across China. Or on very long travel days between cities. During the course of our 23 day trip, we took 7 flights inside of China, experienced 2 train transits and had one long private car ride after getting off of a train. 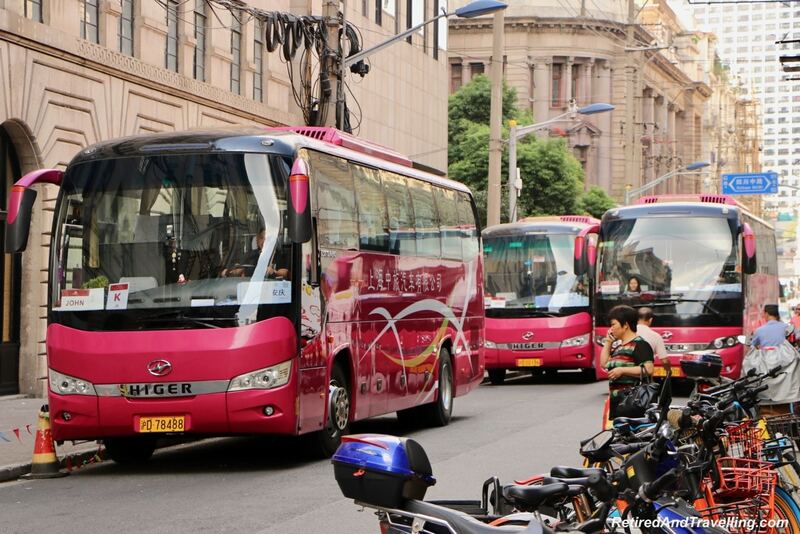 But this extensive travel ensured we saw so much of what China has to offer. The actual river cruise portion was apparently also very different from many other Viking Cruises. The Yangtze River cruise boat was much larger than most of the Viking longboats used in Europe. There were over 250 people on our boat. The boats were not actually owned by Viking but had to be leased from a local company. The means that Viking did not totally control the onboard experience. The Yangtze River was fascinating to transit. The upper section was broad and very busy. When we entered the Three Gorge area, we got a stunningly different vista. A day trip to see the Three Gorges Dam gave us a great look into this engineering marvel. Stops in Jingzhou and Shibaozhai let us see local sights along the route. Night and day, there was always something to see on the Yangtze River. We are not sure how typical the river cruising portion of our first Viking Cruises experience in China was from other Viking trips. We had no basis for comparison to know what to expect for customer service focus with Viking Cruises. Certainly we heard great things before our trip. 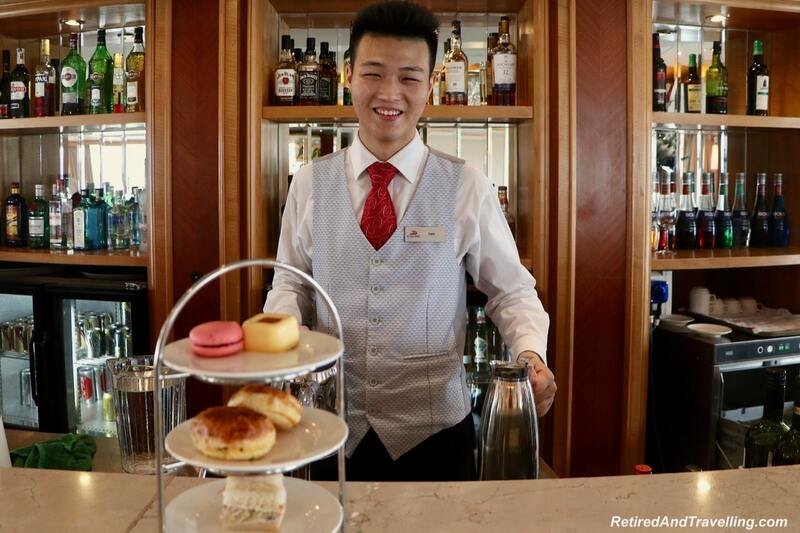 On our previous trips with Oceania Cruises, we absolutely learned that customer service excellence is driven from and modelled by the leadership on a vessel. 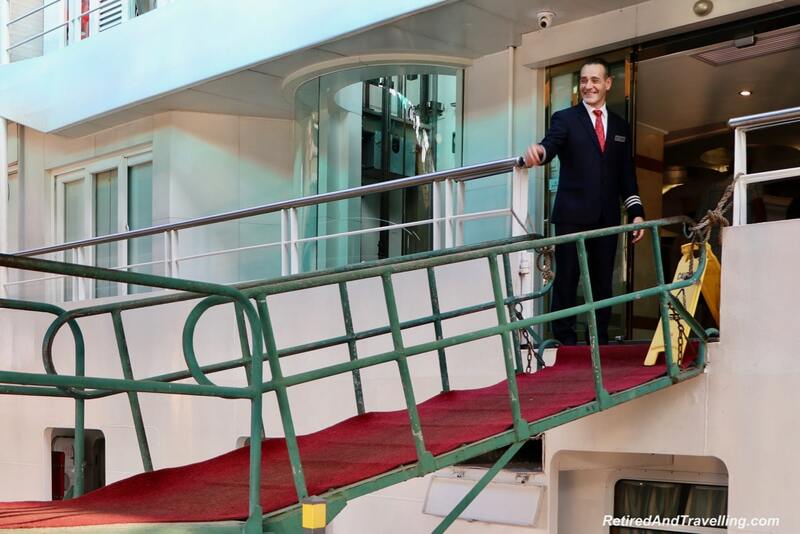 Enrico was the Hotel Manager on the Viking Emerald. As a Viking employee, he was the Viking ambassador on-board. And boy did he excel in this role. Enrico was the most visible senior leader that I have ever seen on any cruise we have done. He started the morning welcoming guests for breakfast. And finished the day at the door into dinner. He circulated to chat with guests and handed out the daily papers. At every onboard activity he was visible and engaged. Every single time we left the ship, he was there to say goodbye. And was the first one we saw on the gangway handing out drinks when we returned. We could not have asked for more personal attention. And we were pleasantly surprised one night. After talking with the Enrico about our blog and travel, we found champagne waiting in our cabin. Just a small sample of the focus on personal service. Our first Viking Cruises experience set a bar for the focus on customer service from the leadership. The focus on customer service was echoed at the next level of management too. Every single team leader watched the service like a hawk. They were quick to swoop in at the first sign of a challenge. And they always went out of their way to fix the issue. This was certainly the way to mentor people providing direct service to the guests. We found virtually all of the staff to be friendly and eager to help. Unlike most other cruises, we were encouraged to wear our name tags. This meant that we were generally addressed by name. While many of the staff spoke or understood little English, they tried so hard to understand. We had little if any issues with language misunderstandings. 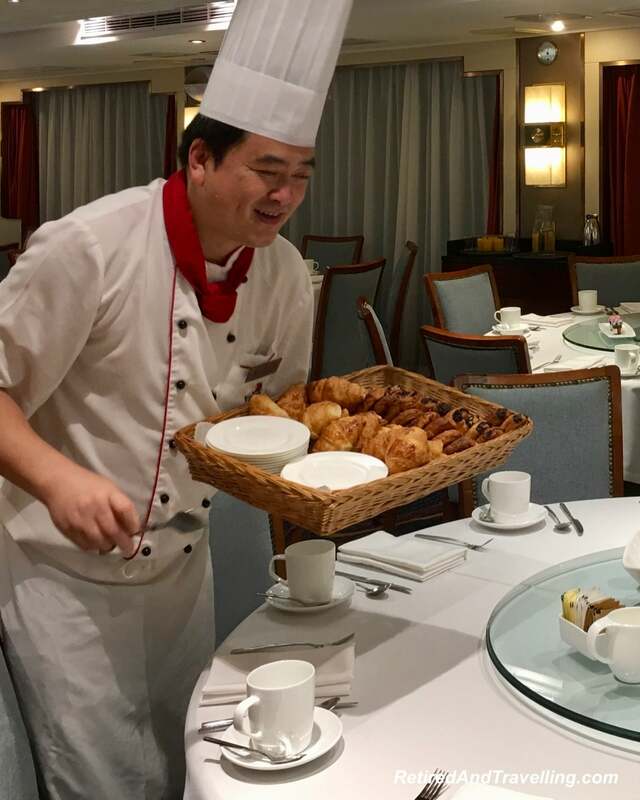 We were delighted with the level of customer service we experienced when we chose to cruise the Yangtze River in China with Viking Cruises. The bar was set high on our first Viking Cruises experience. If this is the standard we should expect, we will definitely want to be a repeat Viking customer. 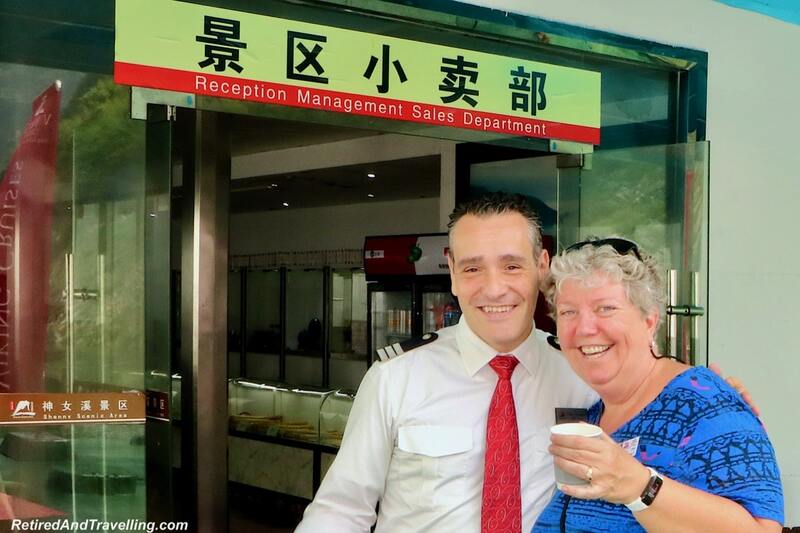 We met our tour leader John when we joined Viking Cruises in Shanghai. Over the next few days we met the 29 other people who were in our group. It was a crazy 23 days to explore China on our first Viking Cruises experience. John set expectations early that this would be a very busy and physically demanding trip. The 6 days on the Yangtze River were the laziest days we got. The other days we were moved out continually. But we did get to see so much of China. 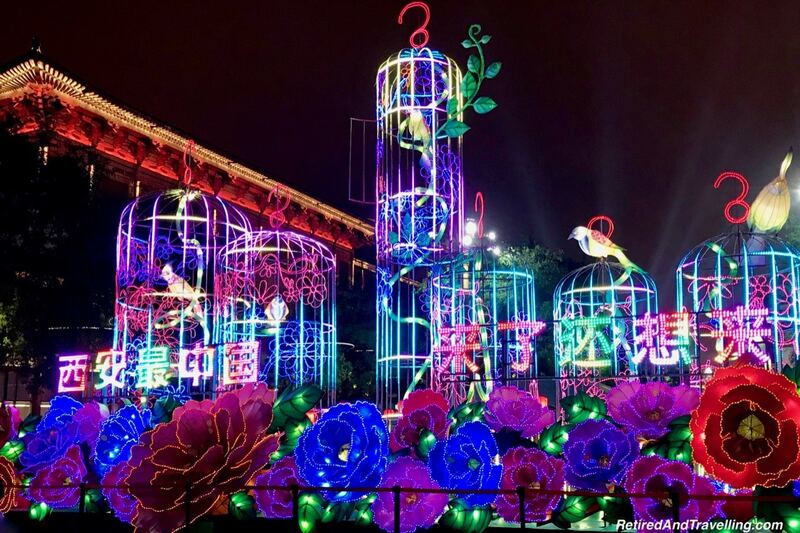 Early morning starts let us see the pandas in Chengdu, walk along the Dazu wall carvings, marvel at the Terra Cotta Warriors from Xian and walk on the Great Wall of China. John was one of the hardest working tour leaders we have ever had. He always made sure we were well prepared for every stop we made on our visit to China. On many of our stops, we got a local tour guide to provide more in-depth information about a stop. But there were many places where John was the local tour guide. He had a wealth of knowledge that he was always happy to share with us. 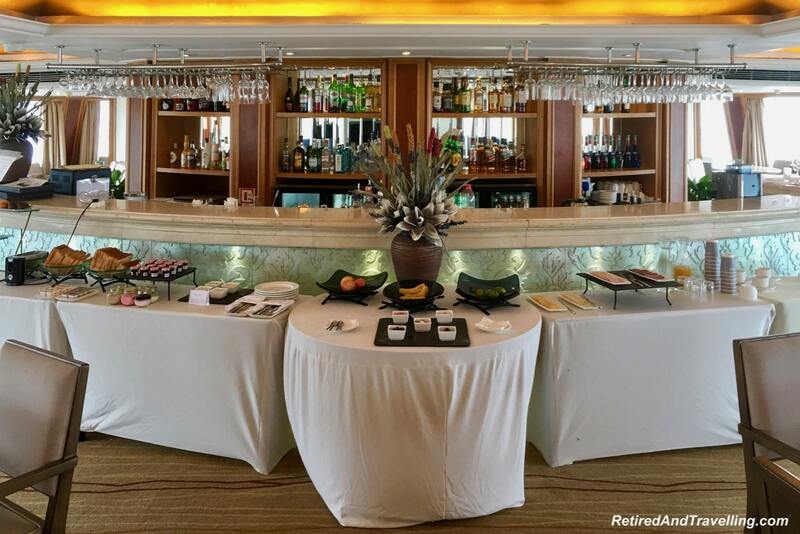 We have experienced touring with a group on many of our ocean cruising trips with Oceania Cruises. After several days of large bus group tours, we vow never to do that again. Yet we keep booking more cruises and more excursions. We tried a very small group tour from Prague to Budapest for with Overseas Adventure Tours (OAT). On our first OAT experience we travelled with a small group of 14 people. Then we booked our first Viking Cruises experience and realized we would be travelling with over 250 people. The 9 groups were split into 3 different hotels in each city. So that minimized a bit the challenge with wrangling people in and out of hotels and hotel dining facilities. But there were 9 bus groups that converged on every tour site. Unfortunately our group was numbered “K”. This often seemed to mean that we were last for everything. I am not sure how Viking assigns individuals to hotels or tour groups. Our smaller group still had 31 people in it. This group tour experience was a great way to meet new people on our first Viking Cruises experience. We made friends that we have stayed in contact with after the trip. On some days, we visited 3 different sites. Most days, three meals a day were done as a group. And our travel between cities was done together. This meant there were always people around. Many of the people were extensively travelled and there was lots to talk about. But for this heavy introvert, the constant social interaction and steady din of noise at times stressed me out. A fellow travel blogger Hannah did a great job of showing the challenges that introverts face travelling. 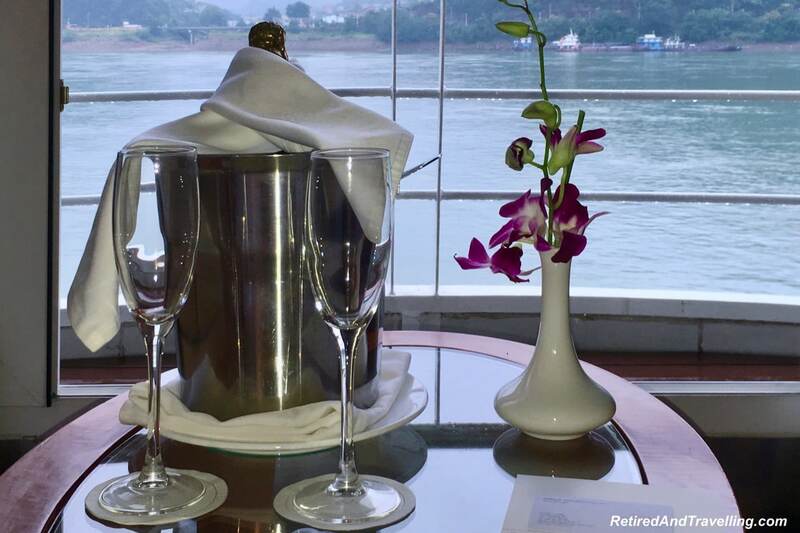 When we cruised the Yangtze, I retreated to my cabin for quiet when I needed a break. A few times we passed on a meal or excursion to have some time away from the large group. Generally the guides did a great job of herding the groups from spot to spot. I am sure it was not always an easy experience for them. But the Viking team supporting the tour leaders took care of so many of the little details flawlessly. The land-based accommodations through our entire first Viking Cruises experience were wonderful. As we travelled from city to city, we were treated to first class hotel stays. The food was great and plentiful. Many of our days started very early and the hotels were great about opening early to accommodate the large group. On several occasions, the hotels provided boxed lunches for us. Hotel locations generally provided things to see within an easy walk of the hotel. That is, if we had the energy after a busy day of travelling. One of our favourite stops was in Xian. Right beside the hotel we had the greatest walk one night! 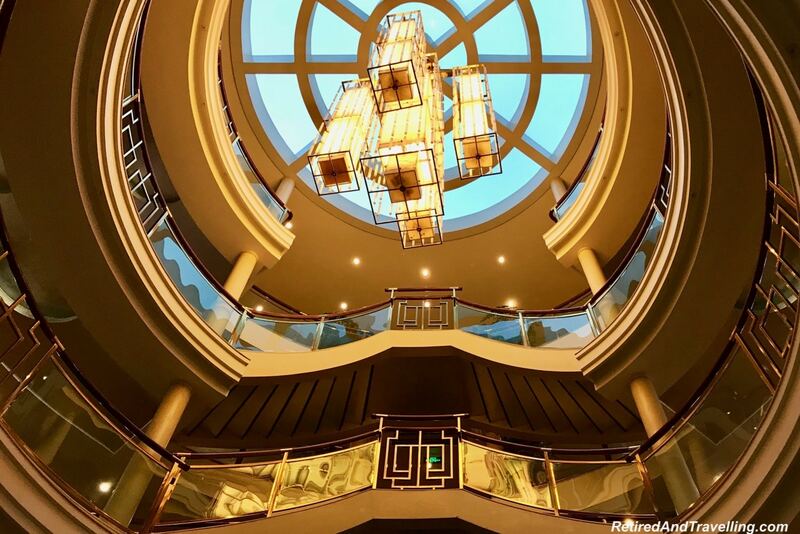 On our first Viking Cruises experience, every detail of our hotel stops was handled well. Our bags got moved to and from our room. Hotel bills were all paid up. We generally only needed to check out if we added charges during our stay. And so many of the hotels were first class accommodations. We just wished we had more time in the hotels some days. 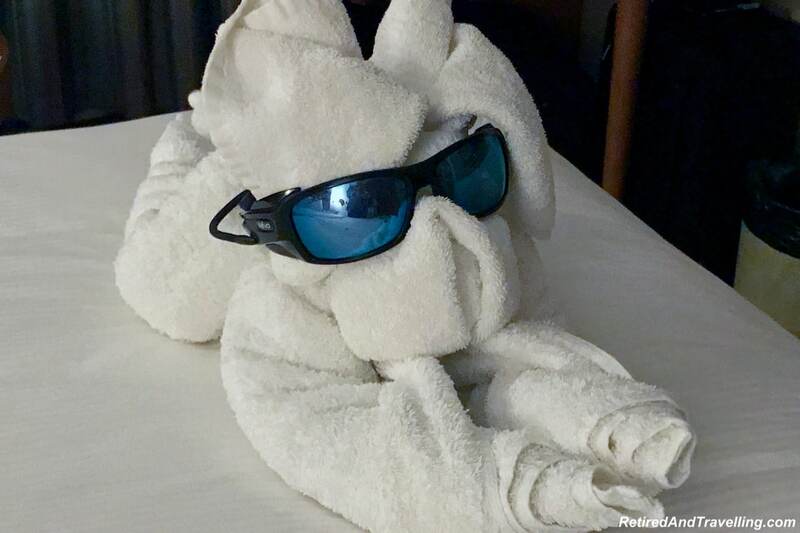 For most Viking Cruises trips, Viking may only have to assist with hotel accommodations before or after a cruise. But the great hotel service we got would certainly cause me to consider letting Viking handle hotel planning again! Overall, we found the Viking Emerald ship to be a bit of a disappointment. We knew going in that it not equipped like some of our ocean cruises. Staff were great but the river boat had seen better days. The common areas were generally well maintained and provided all the basic services. 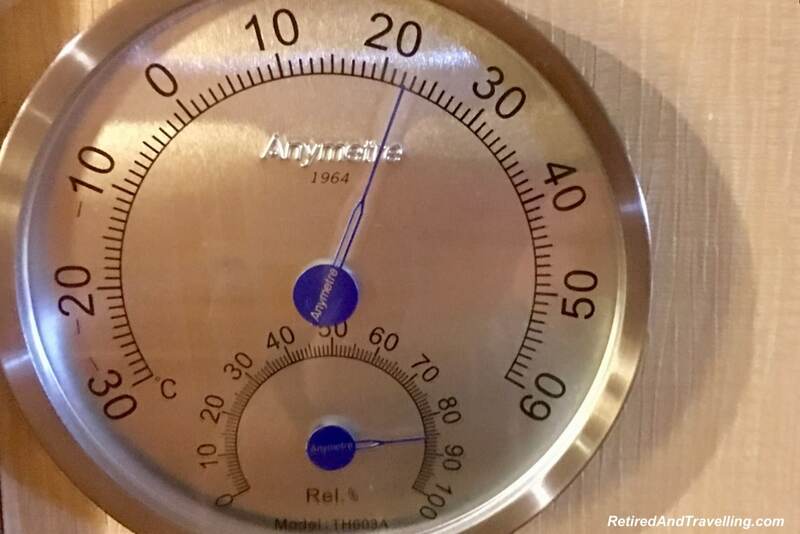 But the 87% humidity levels on the ship were a bit of cause for concern. The cabin size was ok for 6 days. We had a small balcony. But the small closet and the tiny shower stall were bigger challenges. I checked out the bed as soon as we arrived. And finally got a little extra cushioning for the rock hard bed. We asked immediately for foam pillows and were glad that we did once we heard that they quickly ran out. Sleep quality was not great. But then this princess does have a certain standard for her bed needs. We ate well on the Viking Emerald. If you are a picky eater, there was always some choice on the menu. At every meal there was at least one local choice. One lunch and one dinner we had a complete Chinese buffet. Even as spice wimps, we managed to leave the table full. But many people complained that the food was not up to the standard they had experienced on other Viking river cruises. 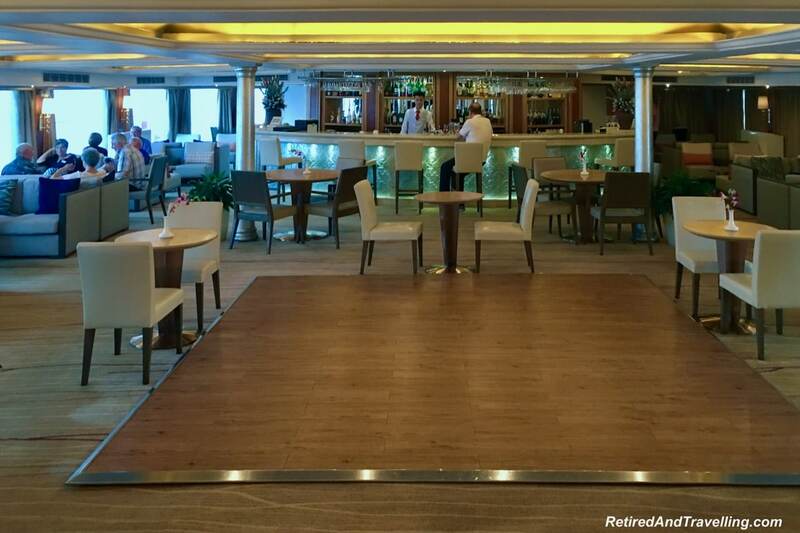 Overall our first Viking Cruises experience on the Viking Emerald was a bit disappointing. Many of the people who had done other Viking river cruises noted that this ship did not meet Viking standards. Certainly the humidity levels and cabins could do with some help. But it was still a good base to explore the Yangtze River. Unlike our experience when we travelled with Overseas Adventure Travel (OAT), the processes leading up to our cruise went smoothly. We got our pre-trip package both electronically and in paper before we left home 6 days early to start in Shanghai. However, on our OAT trip, we were contacted in advance by our tour guide and had an opportunity to ask questions. Because we flew on our own and arrived in Shanghai early, we were not met by a Viking representative at the airport with some basic information. We did not talk to a Viking person until after we got ourselves checked into the Viking hotel. As experienced travellers, we are very wary about ever taking our eyes off of our bags. We stayed at a very high end hotel when someone just walked out with bags sitting with a porter. We always take our bags to our rooms ourselves. When we travelled with Viking, we had to leave our bags out in the hallway for pickup the night before we left a hotel. There was no option for us to take our bags. 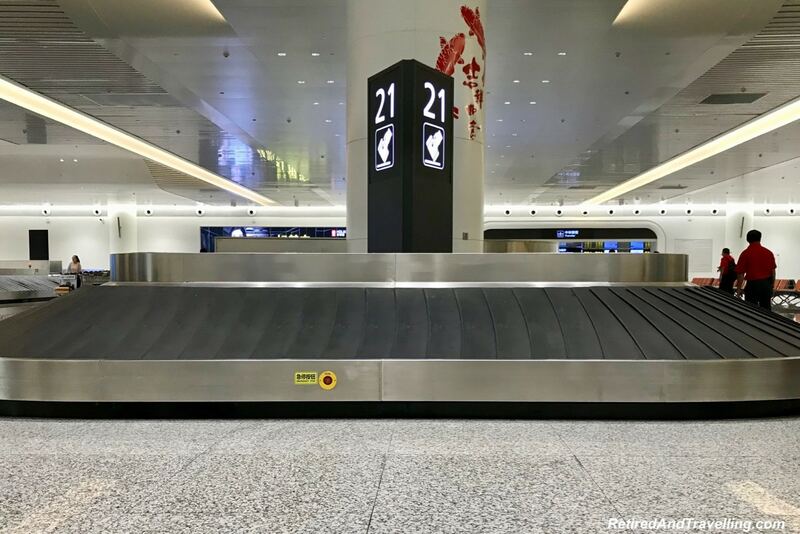 When we were finally re-united with our bags at the airport baggage carousel the next day, we sighed with relief. All our really valuable items were in our care. But I could not head to most Chinese stores and find clothes in my size. If we were a bit freaked out about losing sight of our luggage, the number of times our passports left our hands for days caused us major concern. Photocopies of our passports were kept virtually everywhere. When you land in China, you are fingerprinted. And at hotels and cruise ports, our picture was taken. We will certainly be watching for identify theft for months after this trip. We fretted for days before we left Toronto about the baggage weight restrictions. Both carry-on and checked baggage weights were both lower than we normally expected. And we were told that these limits were strictly enforced. We packed, weighed and unpacked several times. For people who were just doing a 3 week trip, I am sure the baggage limits were manageable. But we were in Asia for 8 weeks. We started in 30℃ temperatures in China and finished up in Japan in late October in much cooler fall weather. We needed to pack for a much greater range of both temperatures and scenarios. Of course we need not have fussed. We quickly learned that individual checked bags had no limits. The view was that the average of all bags would fit into Viking’s overall limit. And we were told that carry-on bags were not weighed. We brought smaller European-sized carry-on bags. But most people travelled with massive rolling bags. We had the same experience when we headed off an Oceania cruise to go inland to see the Taj Mahal. We packed really light and everyone else ignored the weight limits. Luckily on our first OAT tour, we contacted the tour leader in advance and he was more realistic in his luggage guidance. If you can pack light, then my awe goes out to you. But if you need to cover contingencies, the rules may be more flexible than the written policy. The few challenges we had on our first Viking Cruises experience were minor. And certainly would not stop us from highly recommending this trip. The trip to China was one of the highlights of our travels in 2018. 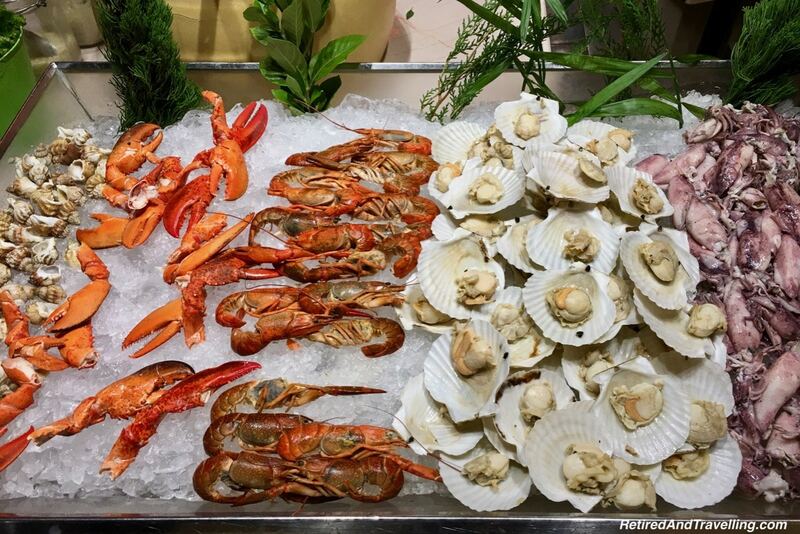 Our first Viking Cruises experience in China was everything that people had told us it would be. We saw so many iconic sights. But it was a very different Viking Cruises experience than many people may have experienced. So little of our trip was actually cruising on the Yangtze River. The pace moving from town to town was fast. But Viking handled all the details. And the travel experience ran far more smoothly than we could have expected. Many people are challenged with making their own arrangements in foreign countries. For those, I am sure it was great to sit back and let someone else do all the planning to this exotic destination. We are pretty comfortable exploring most countries on our own. But we welcomed the chance to take our first Viking Cruises experience to see things in China it would have been harder to do on our own. 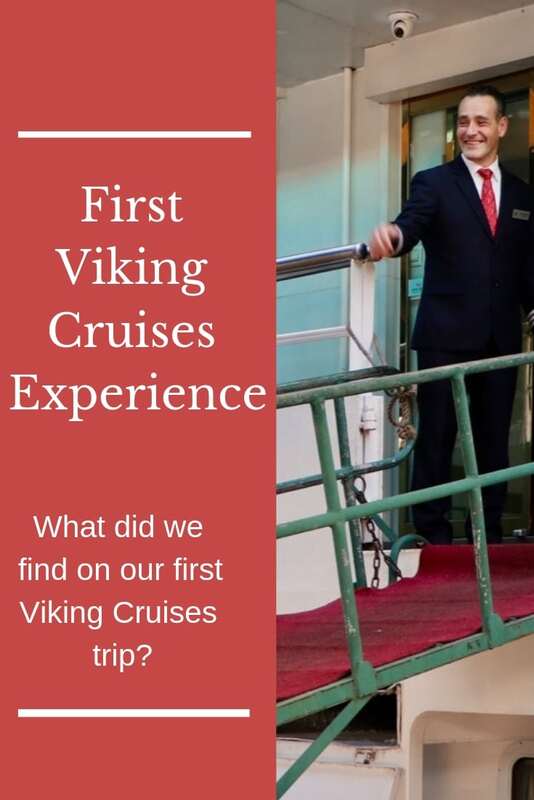 What did you think about our first Viking Cruises experience? Would this be a trip for you? Or would you want to start with a more traditional European river cruise? I had only heard of Viking Cruises for European town, didn’t even know they had any for Asian countries, so this 23 day cruise experience of China was super interesting! 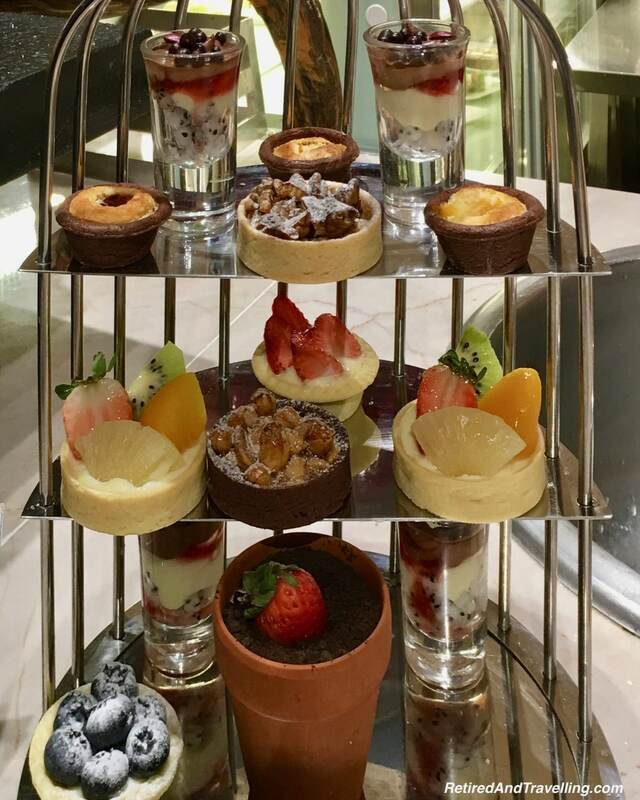 I haven’t really experienced any trip in Vikings Cruises so far, so don’t know why this did not live upto your expectation, but the food selection looks amazing and the staff really looks very warm and friendly! 🙂 If I ever have a month to explore China, I would surely consider Vikings! What a nice cruise experience. I enjoyed the part were you got to see other parts of China and not only the river. Also, Enrico sounds like the perfect host. Is so nice when we get to meet people like him. It turns the trip even more enjoyable. Can’t wait to ear about your next adventure. This itinerary sounds amazing. I am a big cry baby when i don’t get enough sleep so that is concerning and I think I would feel ill with 87% humidity levels! I read about this on your highlights of travel for 2018 and was curious about it. 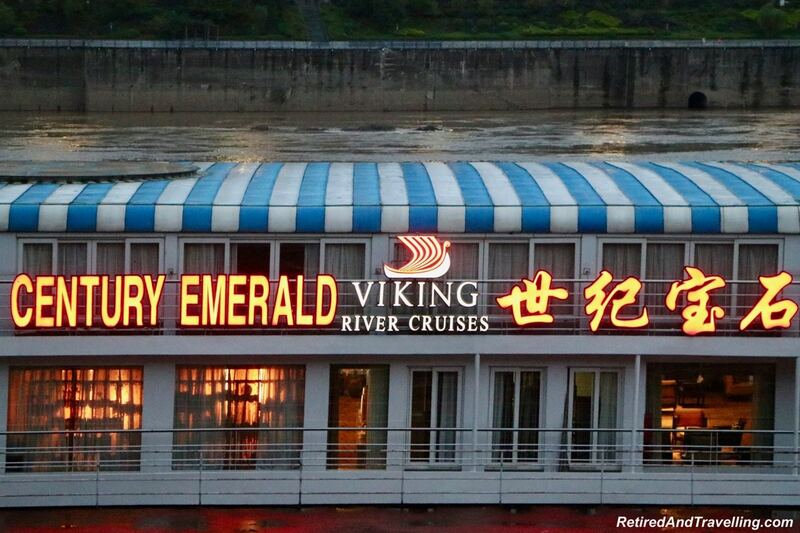 I wouldn’t have thought they would do a river cruise in China. What a great idea and such a nice way to see the sites. The cruise has always been on my list as its luxury meets privacy unlike other cruises with so many crowds. I saved you route for my first trip to China as you both have inspired me to visit the lesser know areas as well! AND THE FOOD …WOW! Great read. 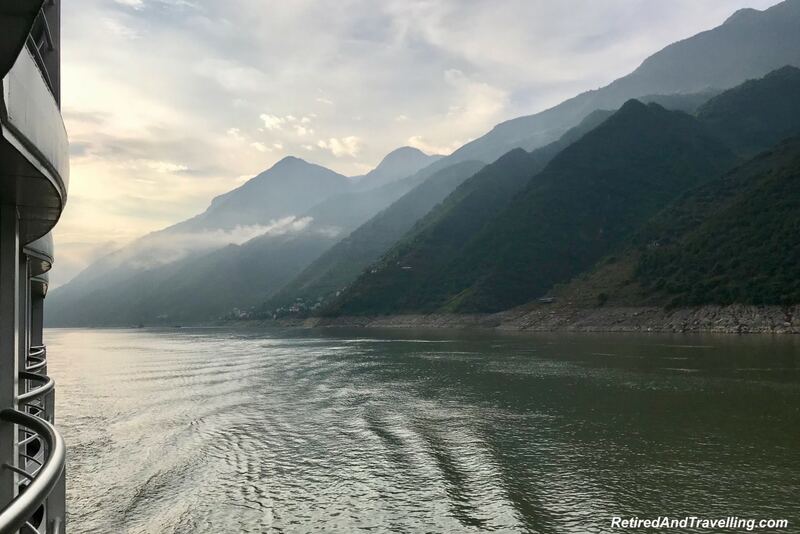 A 6-day cruise on the Yangtze River sounds great and although I have never thought before of it, now I am adding it to my China bucket list. What a nice gesture to get a bottle of champagne in your room. 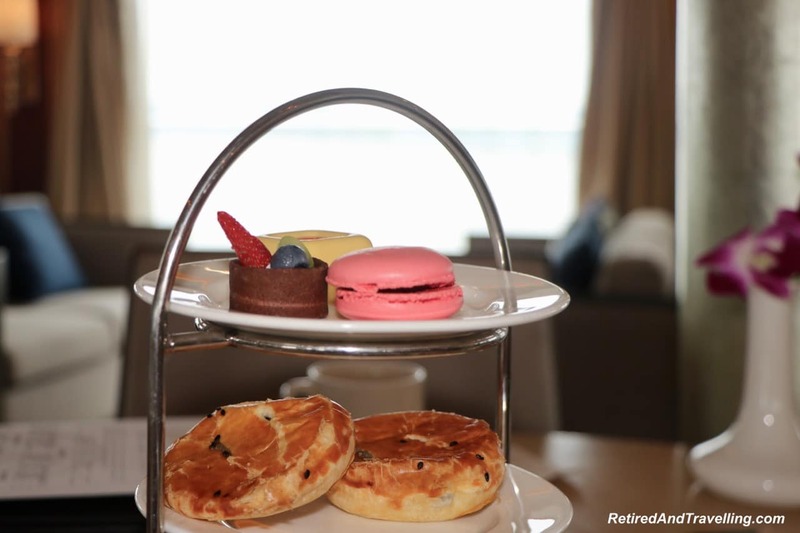 The Viking Cruises did their best to make your trip lifelong memorable. I love that you have included so many details, both bad and good, about your first river cruise (and land excursions) with Viking in China. A river cruise is something I definitely want to take someday, although I was leaning towards a European cruise. Your information is still very helpful to me! Reading our post makes me realize that I would really enjoy a river cruise in China, though I am not a cruise-lover in general. The Viking river cruise seems small and intimate. I’ve been meaning to do a Viking cruise for a while and was interested to read about your experience. I didn’t realise they cruised in China! 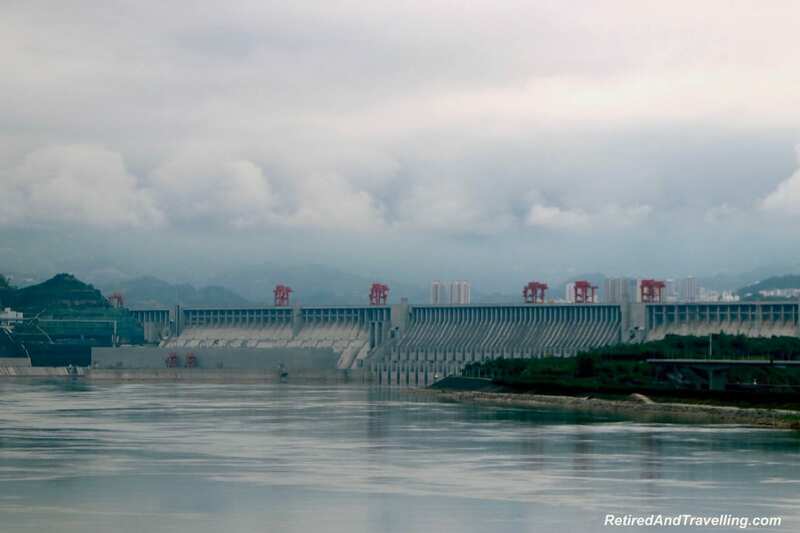 The last time I cruised the Yangtze the dam had only just been finished and many places along the river had only recently been submerged below the river level.